Parathas (pan-fried Indian flatbread) are truly a treat. Crispy and flaky, they go well with most Indian dishes, whether a gravied curry or a dry stir-fry. Don't be deterred by the number of steps in this tutorial—although the process may look time-consuming, parathas are actually quick to make. With parathas, the flakier and more layered they are, the better. How crisp you make them, however, is up to your taste. The dough for parathas is much like the dough for chapatis. To make one dozen parathas, mix 2 cups of whole wheat flour in a bowl with water and salt (to taste). Have 1 cup of vegetable oil on hands. You'll need 2 tablespoons of oil for when you knead the dough. Use the rest of the oil for frying. Once you've prepared it, divide the dough into equal portions, roughly the size of golf balls. Roll between your palms, applying gentle pressure, until the balls are smooth and without cracks. Make as many as you need and keep ready to roll out. Lightly coat one ball with flour. Doing this will prevent the ball from sticking to the rolling surface. Flatten the ball of dough. 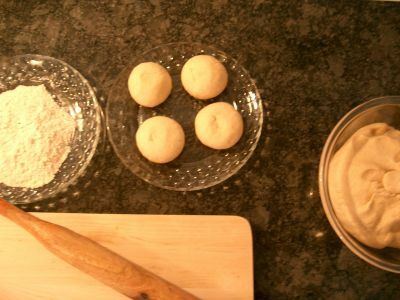 Using a small rolling pin, roll with circular motions until you have a 4-inch circle. Create the first layer. Use half a teaspoon of oil and spread over the entire surface of the circle. At this stage, you can add extra zing to the paratha by sprinkling it with spices like cumin seeds or dry red chili flakes. Now fold the circle in half to form a semi-circle. Spread 1/4 teaspoon of oil over entire surface of the semi-circle. Now fold it in half to form a triangle. How you fold is entirely up to you so have fun with the shape of your parathas! The idea is to grease and fold to create layers. To make a square shape: At the circle stage, spread the oil and then fold the two opposite sides over to meet in the center. Now apply oil on the folded surface and fold the other two ends over to meet in the center. The folding and layering are now done. Flatten the triangle with your fingers and you're ready to roll. You can prepare as many parathas as you like up to this stage and keep them ready to roll out or just make them one at a time. Lightly coat one triangle in flour. Doing this will prevent it from sticking to the rolling surface. Use circular motions to roll out the paratha and try to keep the shape you started out with. While rolling, do not press down too hard as this will cause the layers to stick together and the paratha will not be flaky. Do not make the paratha too thin, either. Stop rolling when it has reached 1/4-inch thick, no matter what the size. Heat a pan over medium heat; place the paratha in the pan. 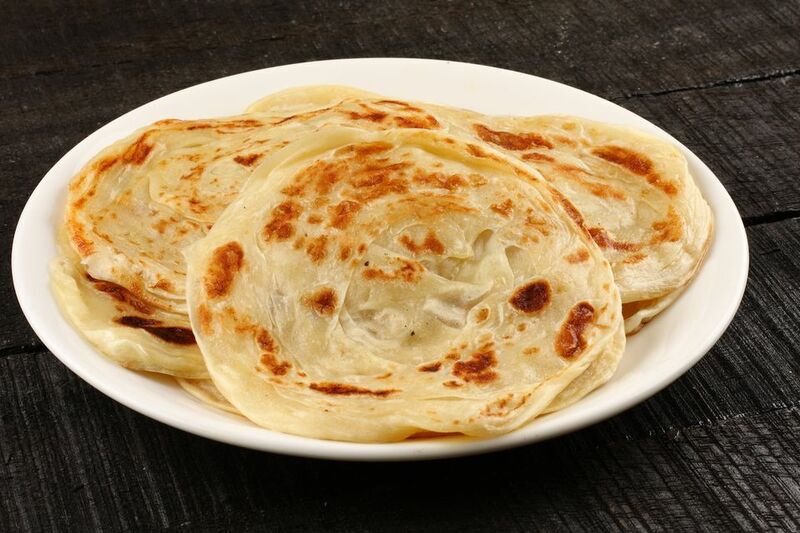 The paratha is ready for its first flip when you begin to see raised bumps or bubbles on the upper surface. Use a spatula to flip it over. This is what the first side should look like after you flip it the first time. Spread about 3/4 teaspoon of oil all over the surface of the paratha. Then flip the paratha over again. Spread about 3/4 teaspoon of oil on the side of the paratha that is now facing up. Flip the paratha once again. This is what the paratha should look like after the last flip. To make the paratha crisp, use a spatula or slotted spoon to gently press down all over the surface in circular motions. Flip if needed and repeat on the other side until you have the desired crispness (a matter of preference). Notice how the layers have separated. The paratha is finished. You can now remove it from the pan and serve immediately, or store in an insulated container lined with paper towel. This keeps the paratha warm and prevents it from getting soggy.